Building an LNG export terminal up a winding river is a major hazard to populations. Save the Peace from Site C Dam! 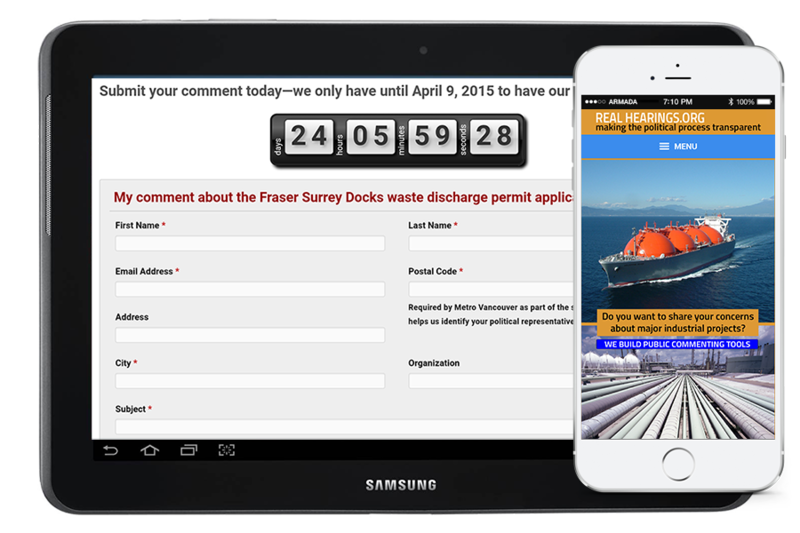 This campaign amplifies public support for an overhaul of Canada’s port governance by the federal government. This transparency campaign amplifies public concerns about the building of the proposed Tilbury Island LNG terminal on the Fraser River. This campaign amplifies the enormous and growing opposition to the Kinder Morgan Transmountain pipeline expansion project. This transparency campaign amplifies the enormous and growing opposition to the building of BC Hydro’s Site C project on the Peace River. This transparency campaign amplifies public concerns about the replacement of the George Massey Tunnel with a $3.5 billion bridge. Real Hearings strongly believes transparent, public commenting on major industrial projects is key to democratic decision making. Large projects by their nature have significant and wide-ranging effects with potential to affect large numbers of people in many different ways. Those people need the opportunity to express their concerns to decision makers, and if they choose, to make their concerns public so others can learn from them too. We believe the environmental project review processes set up by governments are often lacking in transparency, unfairly restrict public input or happen too quickly for the public to provide input. Real Hearings recognizes the need for public commenting to be truly transparent and a matter of public record. Otherwise our trust in government decision making will be eroded. People DO want to have their say about projects that affect them, their families, their communities and the planet. Our mandate is to help their voices be heard – by decision makers and the wider public. “Over the last two years, Communities and Coal has been working non stop to raise public awareness on a controversial proposal to ship US Thermal Coal through BC communities. Real Hearings has been an essential tool in our journey as it allows us to channel that public awareness into public action. “Voters Taking Action on Climate Change is committed to providing the public with opportunities to express their concerns to governments and elected representatives. Real Hearings provides an invaluable tool for that work — a ready made commenting tool that facilitates citizen input on any issue and creates an open, searchable record of public concerns. Eoghan Moriarty (Real Hearings.org) is a registered sponsor under the Election Act.